currently expects to graduate from the Masters of Business Administration (MBA) program at the University of Calgary in 1999. Bruce and Monique are very family oriented, spending time with the two girls and playing golf. Nancy graduated from Industrial Engineering at the U of M in 1986. She took a job in Grande Prairie, AB, working in the Pulp and Paper Mill. Nancy left her posi­ tion in Grande Prairie to returu to Winnipeg to take a Masters of Business Administration (MBA) degree. She graduated in 1989. In 1993, Nancy married Ian Fish and in 1996, their first son, Jackson, was boru. A daughter, Erika, was boru in 1998. At this time Nancy continues to reside in Winnipeg. She first worked at Health Sciences Center in her field of Process Engineering and in 1997 found a position with On Line, a process engineering company, where she continues to work. Nancy and her family enjoy many happy hours at their cottage on Kendall Inlet, Lake of the Woods. Donald Norman 'Don' remains on the farm. 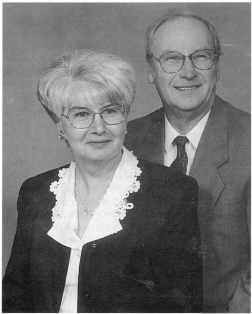 In November 1987, his parents, Harold and Irene, moved to Erickson into a new house built that summer. It is located immediately south of the Co-op Store. In 1993, Irene became ill and was unable to remain in the house and became a resident of the Personal Care Home of the Erickson Hospital. For two years, she was able to make daytime visitations to the house, but inAugust 1995, Harold found it necessary to move to the PCH also. Irene passed away on December 23, 1999. Since November 1995, various tenants have rented the house. Meanwhile, at the farm, Don has sold the home place to his brother, Eric, with the understanding that he can remain living there as long as he so wishes. Eric has built a new house right beside the old one of Don 's, that was built in 1920. Don intends to help his brother with the farm work as much as time permits between golf games. He'll also farm the quarter of land still owned by him, which is located in the RM of Clan william. Don still likes to curl and has taken up golfing to offset the discontinu­ ance of fastball. Shirley Anne remained as Director of Nursing at the Carberry Health Facility until her retirement in 1998. She is divorced. Her daughter, Deborah, lives in Winnipeg and works for the Workers' Compensation Board. Daughter, Shari, married Alan Baraniuk of Mountain Road. They reside in Saskatoon, SK, where she is a consultant for LGS Group Inc. and AI works for Agriculture Canada. They have a daughter, Shaina Lynn, and a son, Matthew Alan, boru September 8, 1999. Shirley's son, Derek, lives in Brandon and is employed by Manitoba Hydro. During the year of 1999, Shirley sold her home in Carberry and has built a new one in Strathclair on the East shore of Salt Lake. Eric married Judy Strong of Langruth, MB. Judy passed away after a battle with cancer on September 19, 1997, on her 47th birthday. Eric now resides on the farm property where he was raised near Onanole, MB and works from his home as a Project Manager for Total Care Technologies Inc., a computer software development company, ofKelowna, Be. Their daughter, Tiffany, lives in Toronto, ON and works for the Crown Plaza Hotel. I, Al Gustafson, was boru November 7, 1932, in the Rural Municipality of Clanwi lliam SE 18-17 -18W, to Bert and Gudrun Gustafson. The first school I attended was Westmount. Then our family left the farm and came to Erickson where I took grades two to four. When my Dad enlisted in the Army we moved to Minnedosa. In 1946 our family moved back to Erickson where I received the rest of my education. October 22, 1955 I married Josie Rudniski, daugh­ ter of Joe and Katie Rudniski. Josie was boru March 16, 1938 in Ozerua, MB. Josie received her education at Round Lake School and later finished her education at Erickson High School.